The spacious apartment, 100 meters square, is on the first floor of a large house. 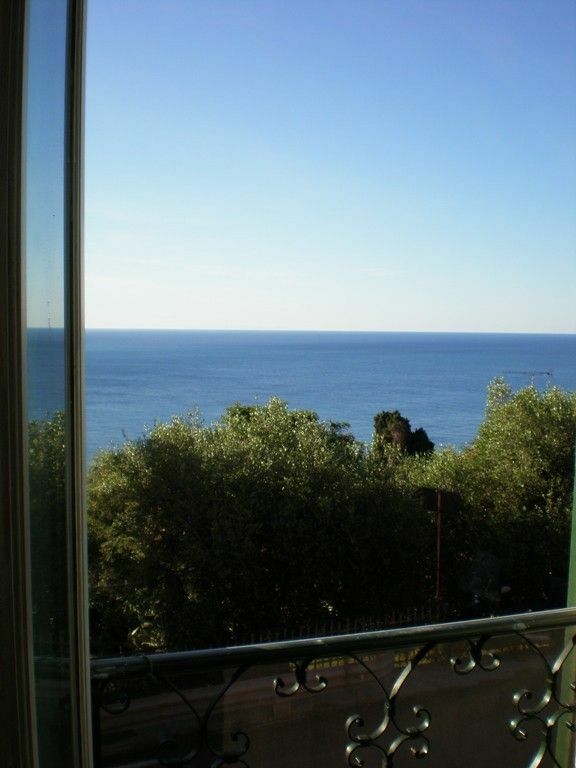 Excellent , exposition, east, south & west, with magnificent sea views towards Ventimiglia & France. It is opposite & overlooks the Hanbury Gardens. The high vaulted ceilings conserve the original architectural design. The entrance is into a large and luminous well equipped kitchen & dining area, which leads into a very large living room which is divided into two areas. The first is light and has a big couch and comfortable wicker chairs the inner living area has a large corner couch and t.v area. The 2 bedrooms lead, separately off from the living room. The first is a bedroom with double bed, the second has 2 twin beds. Both bedrooms have separate access to the large bathroom which has WC, shower, sink area & washing machine. The house is full of books and paintings. Soon to have internet. There is a cellar for the use of the guest for storage . I live in the hilltop village of Perinaldo, 40 minutes from Mortola. I will always be there to welcome you upon arrival at whatever hour & be available in case you need me. This property in Mortola Inferiore is ideally located for guests who wish to explore France, Italy & nearby Monaco. If you do not wish to drive , there is a train station at Menton Garavan, 5 minutes away, which is serviced by the local train which stops at every village on Côte d'Azur. Plenty of restaurants in Ventimiglia or Menton. Excellent supermarket in Latte, which is 1km down the road. This is a large bathroom. It is a very comfortable, lots of books and beautiful paintings. Mortola Inferiore is in a privileged Franco Italian border region. The hamlet of Mortola is a few km from the French border& the lovely seaside town of Menton on the Cote d'Azur & 4km to Ventimiglia in Italy. 45 minutes to Nice airport. Close to train stations in Italy & France. 5 minutes from the beaches and the very famous surfers beach of le Calandre is only a few km away. 10 minutes walk straight down the hill to the sea. Minutes away from the famous caves of Balzi Rossi.15 minutes from the well know Principality of Montecarlo. Monaco is 15 minutes away. For garden enthusiast the Hanbury gardens can be combined with visits to some of the French gardens in this part of the world, particularly in Menton, just down the road.